Decorate your very own royal home! Open the golden gates of the magnificent Jasmine palace! 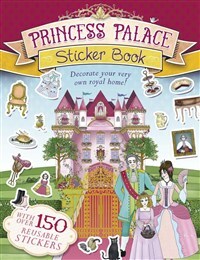 Explore the princess's magical home, then use the reusable stickers to bring the palace to life and ready for a grand ball! Help the princess choose the most beautiful ball gown, add flowers and fountains to the palace grounds, spruce up the golden carriage and and horses ready for the evening and put some scrumptious meals on the banquet tables. Then discover the exciting colouring and puzzle activities at the back, too! Jim Pipe has a degree in Ancient and Modern History from Oxford University. He has written more than 100 children's titles, including history, graphic novels, and fantasy books.